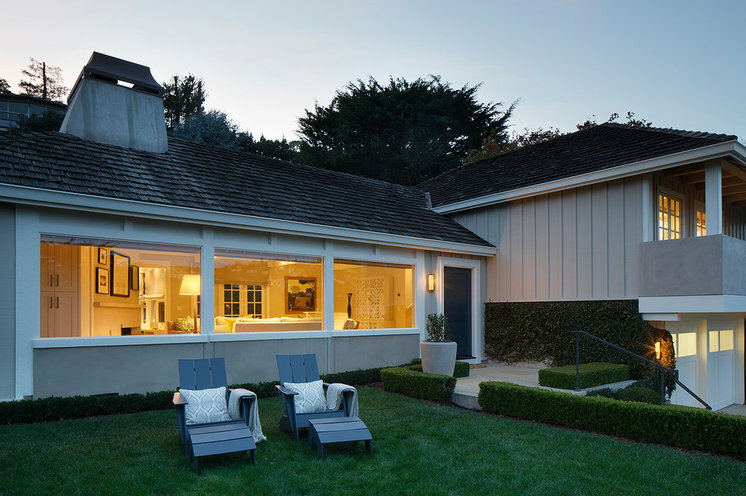 After her husband passed away, Penelope Draganic and her son, Sam (age 16), and daughter, Vivi (9), moved from their larger home to a three-bedroom, two-and-a-half-bath bungalow in Belvedere, a scenic community in Marin County, California, by the water, just north of San Francisco. Draganicwanted their new home to feel like a cozy nest where the family could create new memories while incorporating older sentimental pieces. She and designer Eugenia Jesberg paid special attention to the living room, the first space people see when they enter the home. Wanting the room to set the tone for the house, they used a fresh, light color palette with blue and green accents that reflect the shimmering lagoon just outside the windows. BEFORE: The existing living room had nice architectural details but felt dark and gloomy due to a dingy brown wood floor and Venetian plaster on the walls. 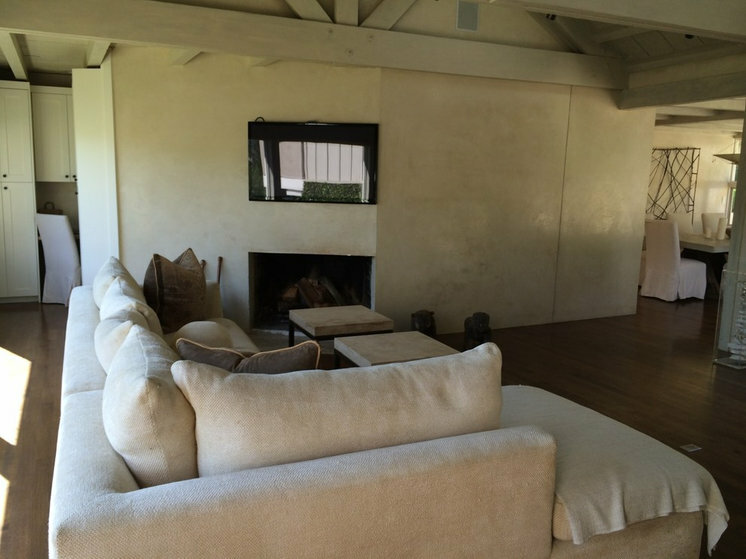 An existing fireplace off center on an angled wall also created a challenge. 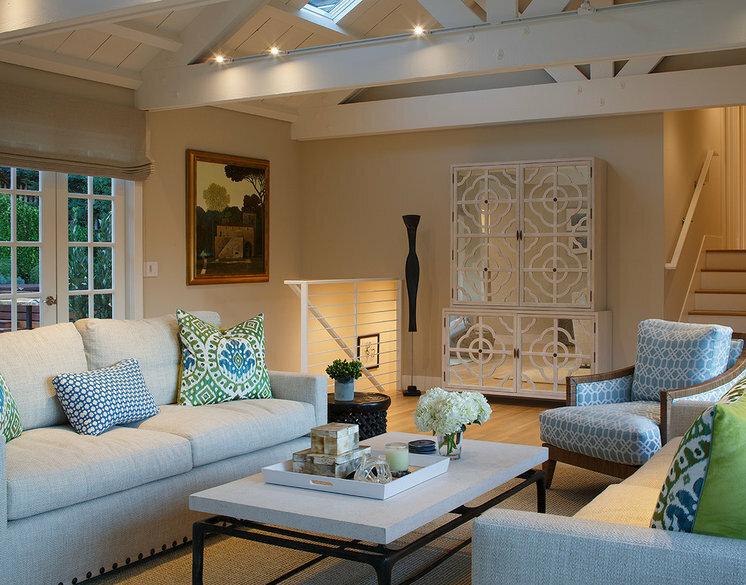 The previous homeowner had a TV on the wall, but Draganic wanted the room to be all about conversation. AFTER: Now a gallery of framed drawings, etchings and family photos adorns the top part of the angled wall. “Instead of making the focus on one piece, this helped give us the flow we wanted for this room,”Jesberg says. Limestone wraps the bottom half of the wall with a subtle pattern that introduces movement and depth. A custom standing glass fire screen provides clear views of flickering flames (or logs when there’s no fire) as well as protection. The open furniture arrangement is meant to be inviting no matter where someone enters from, while the facing-off sofas (designed by Jesberg) encourage conversation. “We wanted to create a space that felt cozy but not crowded, and I think we accomplished that,” Draganic says. 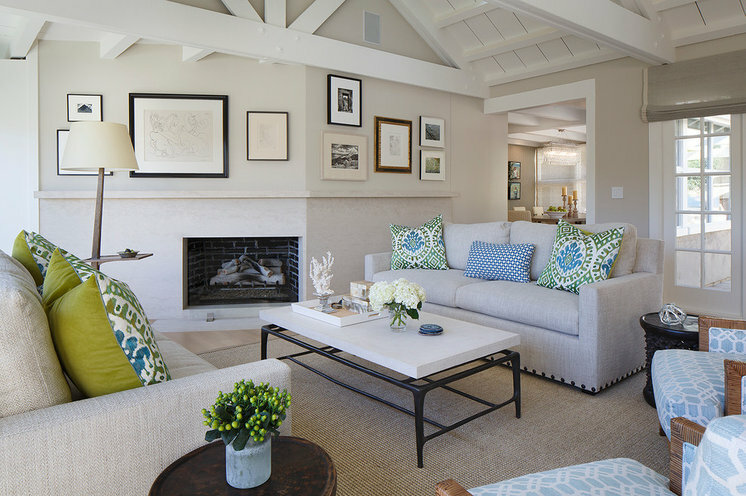 Blue and green pillows and side chairs add color and pattern to the earthy gray walls and white trim. The neutral twin sofas have a welcoming, textural feel and were treated for stain resistance to make them user friendly for the family. A nail detail adds a bit of surprise. 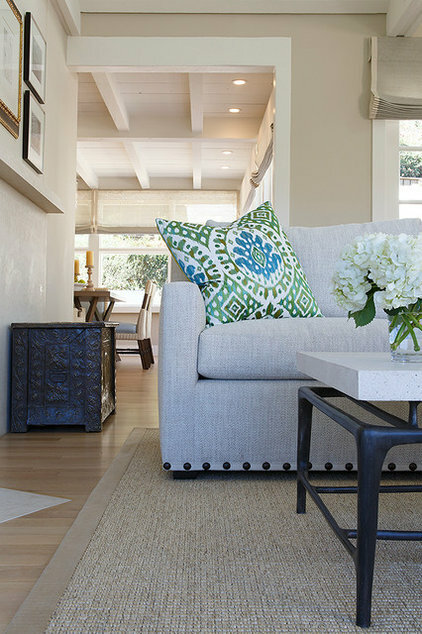 “Because the sofas and rug were so plain, that little bit of detail gives a punch,” says Jesberg. The metal coffee table has a resin top that looks heavy but is soft to the touch. A sisal area rug warms the oak floor, which was stripped and bleached to a light matte finish for a coastal feel. The antique trunk seen on the left here is a family piece. BEFORE: Previously the back of a single sofa greeted guests at the front door. 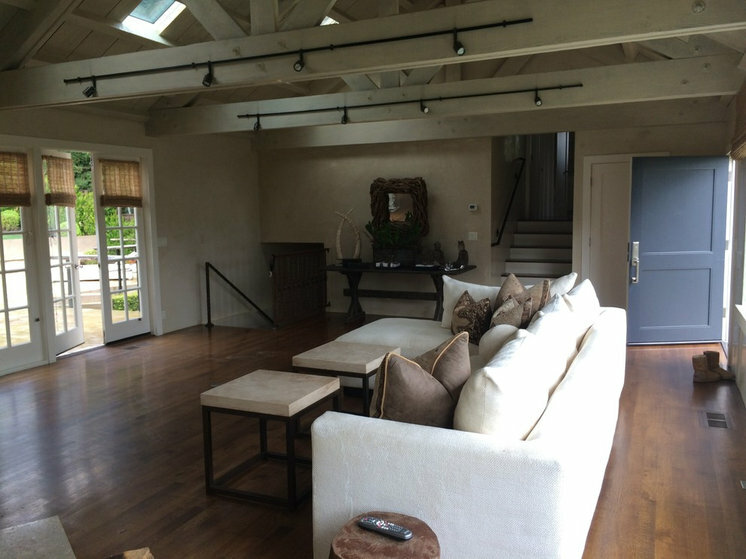 Black track lighting stood out on the wood beams, while the dark stained floors and wrought iron stair rail leading down to the family room added to the room’s muted feel.